If you take the train and get off at the 116th street stop, you are immediately overtaken by the essence of uptown. Here, it is unmistakably, unabashedly Harlem in all its glory. There is still an element of elegance, artistry, and ferocity reminiscent of the times when the neighborhood was a stomping ground for the likes of Zora Neale Hurston, Langston Hughes, and Duke Ellington, but Harlem has definitely changed since the 1920's. Whether that change is for better or worse all depends on your perspective. Though Harlem has a rich illustrious history, even today it has a dark side, as so many places do. Walking down the street, the wrong look can still lead to a fight, a staggering amount of homeless people are often lined up at the numerous shelters and food pantries, there are boarded up buildings, and at night a somewhat concerning number of rats casually stroll the sidewalks enjoying the area as if they pay rent. However, while there are many places in Harlem that are representative of its unique cultural history, few are as significant as Morningside Park. Only blocks away from the formidable Central Park, in West Harlem, this stretch of land runs from 110th to 123rd street. It’s curvy, hilly, green, and comes equipped with two sets of basketball courts and a playground. During the summer the smell of barbecue chicken, burgers, and the coveted perfect potato salad cuts through the suffocating heat as Harlem residents grill and socialize on fixed pits. More than simply a respite from the malaise of urban sprawl, it stands as a symbol of the changing demographics and perceptions of Harlem, which have marked the neighborhood’s history since the late 19th century. In this sense, the park serves as a metaphor for the racial tensions that exist not only in New York City specifically, but within the entire United States. It is reminds us that while America may be more diverse in population than at any point in its history, it is more segregated than ever. Atop the park sits an icon of prestige that is also a New York mainstay. Glaring down on the neighborhood below sits the singular Columbia University, protected by the daunting stone steps that melt into the foliage and lead you to the final resting point. Now, of course, Columbia isn’t some new development. The University, founded by Alexander Hamilton and originally named King’s College, is as cemented within New York’s history as the Yankees, public transportation, and attitude. To someone standing at the bottom of Morningside and looking up at the college dorms towering above, it does beg the question, was the placement of Columbia’s campus a strategic move that was expertly executed to maintain a classist and segregated Harlem? Did they realize the symbolic representation of economic divide that their facilities would eventually become? Upon further inspection, it’s difficult not to believe they did, and that they knew that high ground physically and mentally correlates to higher status. Where does the king sit? On his throne. And what do people do when they meet the king? They bow. And what happens when the people realize the king is nothing more than a person they allow to have power? They just learn to hate the one who rules. Morningside Park doesn’t necessarily have the best reputation; it is known to be a proving ground that only the hard will survive when the sun falls behind the West Side Highway. Even today, though the park has become less of a hot spot, passing through at night will, at the very least, have you quickening your gait. Despite the security booth at the top of the park and the almost permanent police SUVs stationed along the walkways, it’s difficult to ignore the stories and past history of the place. Since the 1900’s, the park has had a reputation for being unsafe. The residents to the west of Morningside Heights appreciated the barrier from lower class Harlem. Columbia even posted warnings in the early 20th century that it was dangerous for their students to enter the park, day or night. The white upper class of Morningside Heights didn’t want to share the park with the students and the predominantly black residents of Harlem didn’t want the college there either. It became a 20-hectare plot of land that represented the state of the country. By the sixties, the University itself pushed to regain dominance of the park only to be foiled by their own students. The school proposed a gym to be built in the park, which was protested by students who stated that the double entrances, one east facing and one west, would create a segregated gym resulting in an inevitable race riot. The resistance wasn’t worth the fight for Columbia, so they abandoned the plan to build, and a gym that could have connected the communities became nothing more than an abstract idea and a muddy crater. While it’s more pleasant to attach a Disney movie ending to this forgotten conflict, it is also unfair to put one side on the wrong side of a history that never happened. The question of who was misinformed, misunderstood, and mis-intentioned isn’t important, but the fear that existed in crossing the neutral zone is what mattered. After the smoke cleared, the park ultimately won out again. While it innocently sat there, unknowingly being the hypocritical land on which students and residents stood to protest the entering of the park, it received a reward. The crater that was left became the iconic pond and waterfall enjoyed by all. Today the park is considered clean and safe. On a Saturday afternoon, it’s not uncommon to pass by a younger white woman sunbathing in the grass while the ice from her cold brew has become nothing more than condensation on the cup, and only a few feet away basketball games with mostly young black kids are being played. At first glance, it doesn’t seem to be a big deal, but when remembering the history of this specific park, in this specific area, it is relevant that the exact thing that was feared only 50 years ago is now the reality. In this respect, change is undeniably good, a sign of an increased tolerance and the ability to cohabitate. However, as is always the case, change comes with a price. Gentrification is nothing new to anyone or any neighborhood, it is happening everywhere and will not stop anytime soon. Brooklyn has been on the forefront of the war against it as well as for it. In case you have been living under a rock or in outer space for the past fifteen years, gentrification is what happens when a neighborhood is purchased for a low price due to it’s perception and upkeep. The housing complexes, the empty lots, storefronts, basically anything that can be sold and purchased is bought by the city and/or a number of developers, then they invest, put a new facade on the neighborhood while keeping a diluted version of the pre-existing culture that was there and resell/rent at a huge markup to a (mostly) young wealthy clientele. These newcomers are often looking to escape the classic neighborhoods of class but do not want the dangers or issues that come with living in a middle to lower class neighborhood. The reality is that in this process the original culture of the area is either wiped out or over saturated with false versions, the prices of homes are increased forcing out the residents in the area who lived there, and the price of living dramatically increases with the demand. An example of this is if a sandwich at your local deli always cost five dollars, then gentrification starts, now all the new hip delis are selling sandwiches for ten dollars and the local delis rent has been increased. So naturally that local deli starts to sell the same sandwich for eight dollars, which is cheap for the people moving in but has become too expensive for the people who have been there forever. It’s an organic and new age way to exterminate a neighborhood wrapped in the lie that it is there to help. It is the city’s way of survival of the fittest, except the odds are tilted, as if thrown into the gladiator pit to fight a foe with a sword, armed with only a toothpick at your disposal. The key factor to this process is regardless of how society changes and advances, and the barriers that have been crossed on the grounds of civil rights, neighborhoods will always have their history. Just like the barrier Morningside Park creates between neighborhoods of the haves and have nots, deeply ingrained public perception has the same effect on a society’s physique. Therefore, like a restaurant that is shut down for a rodent problem or a nightclub that experiences tragedy, the answer to these issues is not assess, solve the problem, and better the establishment. Why would it be? Instead, the answer is much cheaper and simpler: advertise, change, and re-brand. The same is done for neighborhoods. It is hard for landlords to rent a three bedroom apartment for 3,500 in Bed-Stuy, but in East Williamsburg that’s a deal, regardless if it’s the same exact apartment. West Harlem has a similar rough reputation, so who the hell would live next to one of the most notorious crime hot zones in the city? But living in SoHa, which is the new slick abbreviation given to this section of Harlem by real estate developers, seemed edgy and cool. It's the newest attempt at re-branding a neighborhood. And that park that has seen it all is still there, and is still the central part of the community. The park embodies both communities, the now beautiful greenery and lake, the new playgrounds presenting a safe haven for children and the well-kept fields parallel the class and status of Columbia. The parks rough edges, jaded cliffs, the basketball courts missing nets and holes in the chain link fence keep the heart and soul of Harlem. It’s this mix of culture, the perfect clash that creates one of the most unique places in New York. And this is the culture that re-branding such as “SoHa” destroys. Through the process of gentrification realtors will work to erase these conflicts in culture, and that’s not always for the best. Harlem is known everywhere as a leader in arts, food and style. That’s the point that is often missed when realtors try to take over a neighborhood, the value of the area doesn’t come from a fancy name or often even the location. Harlem isn’t an attractive place to live because of the location, it isn’t living in the hundred blocks of Manhattan that has made it one of the most universally known neighborhoods in the world. It’s all in the history, the exact thing they attempt to rid themselves of, in which the true value lies. 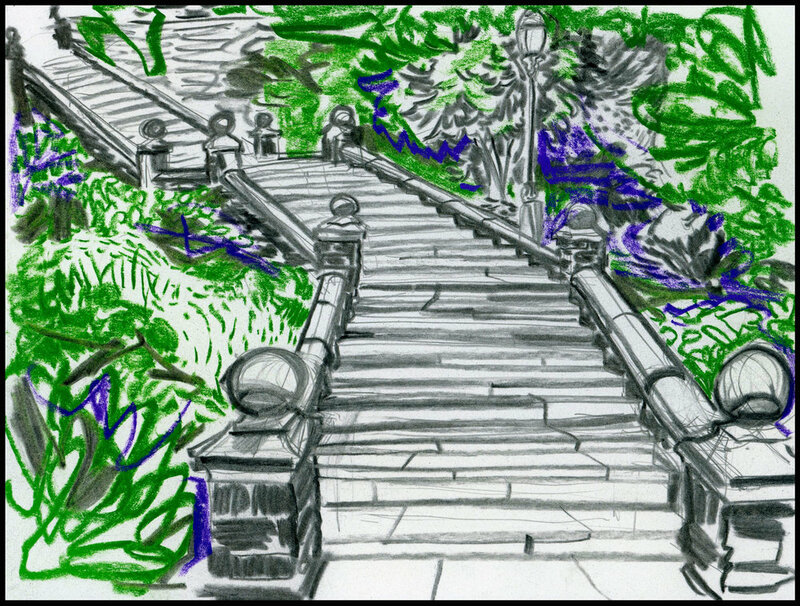 At the peak of the grand stairs in Morningside Park, there is a small landing with a semi-circle stone bench. Right in the middle of this semicircle is a stone statue of a man, the placement of the statue creates a perfect line down 116th street and through the center of Columbia’s campus. The statue is of Carl Schurz, which at first may seem to be just another random figure to get a statue in the over saturated market that is Civil War hero memorials. The German born Schurz fought for the Union army and was on the side of anti-slavery. He formed a political career off the belief of honest and responsible government, during a time of mixed intentions within the U.S. Schurz preached that government should abide to the highest moral standards. 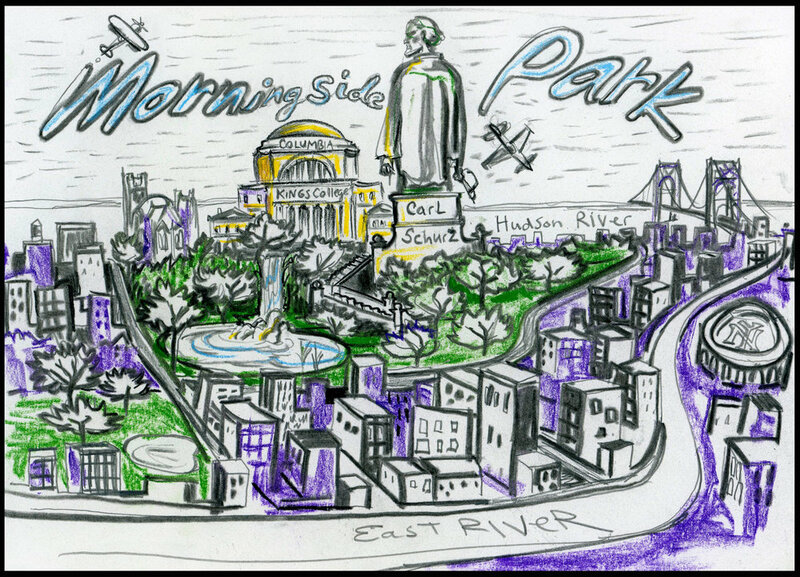 For these reasons, it is not difficult to see why his memory would be placed at Morningside Park, but it is interesting that he faces Columbia. When standing at the base of the park and looking up the statue's backside, it is in line with the symbolic nature that exists at Morningside. The most prominent memorial at Morningside Park turns his back on the lower income neighborhood and instead stands watching over the privileged Columbia. Today, West Harlem is in a strange in between phase. It’s not unusual for one block alone to have a rundown building on one corner, standard brownstones or five story residential buildings in the middle, and a modern designed new development on the opposite corner. Mom and pop shops sit next door to new wave stores and restaurants. You can find yourself strolling past the newer residential building boldly named SoHa 118 only to turn the corner and see “This Is Not SoHa” tagged on the sidewalk or scribbled on a chalkboard next to the lunch specials. For now it seems that maybe a happy medium has been reached, the neighborhood feels safe which is a positive change from it’s history overall. So while yes, a Starbucks has of course planted itself here, the culture of Harlem and it’s afro-centric roots appears to be ever prevalent. There is an element of community that can still be felt in West Harlem.